This one issue is just another opportunity to determine the course of your life, your heart, and your mind. The story that you tell yourself about it, is the course you set. No matter what the motives of any other person regarding the decisions and opinions that they have about you – it cannot chart the course of your life or your value …. unless you agree with them. Our stories are ours to choose. Even when faced with “facts” we still have the choice to perceive them differently and act accordingly for a more loving outcome. As an example, let’s say that a sibling is getting married and you have not been invited to participate in this happy event, but everyone else has. The obvious omission of you in these events is like a cold slap in the face or a knife in the heart, isn’t it? 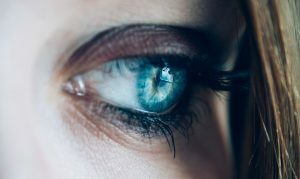 Old memories of other hurts and disagreements flood your memory and the scalding lies that have shaped how you feel about yourself and them – are once again reconfirmed, stirring anger, hatred, and emotional pain. 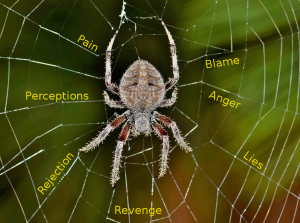 The “story-spider” begins to spin its evil web of lies, rejection, hate, and blame. To give in to the temptation to entertain the story is to get caught in the snare and be devoured by its poison. In this case, a wedding is being planned – and it’s about the bride and groom. This wedding is not about you. But you could make it about you – in a good way, or a tragic way. The only way we can change how people treat us is to stop expecting (believing and agreeing with) the negative judgments and behaviors. Instead, we can change our perceptions about an event and the story that comes with it. The “truth” about a matter is not nearly as important regarding our health and wellbeing as is our perception of it. A patient told that they are dying of cancer can still overcome that frightening diagnosis by believing that they can – and acting accordingly, by living their life differently and eliminating the toxic elements in their lives that have contributed to their cancer. Relationships can be life-giving or toxic – and in the end, they can create cancer in the body because of the continued stress of stuffing toxic emotions. By giving the gift of releasing the political red tape that comes with family expectations (they should have invited me too) and instead, asking where you can help THEM (not you) as a gift of love and support, you give the greatest gift of all and begin to change how others treat you. Instead of being a victim. Choose to be victorious and rise above how you were raised. Choose a different outcome. Be surprising and generous with your love, appreciation, support and kindness. Because what you sow – you will reap. Take responsibility for this experience. Resist defaulting to a childish reaction of hurt and assumptions. Those reactions are extremely difficult to turn around in family situations – but they are not impossible. Trust me. You are better than the lies you believe about yourself. You don’t have to walk this out alone! Contact me to help you think through the programs and automatic responses of your family nightmare towards your dream of peace in the midst of family storms.